I came up with the idea for this throw blanket right around Christmas time. Every year I try to make things for my friends and family that I know they will love. Obviously this leads to buying many different colors of yarn to suit each person’s preferences. I always wind up with a bin full of “half-skeins” and bits and bobs too small to make anything on their own. This year I took all of those random yarns and put them in a big duffel bag. Sometimes I can be a bit picky about color palettes and whether or not they match. This felt creatively freeing because I knew it would be a mishmash of color, so it really didn’t matter where I put each one as I went. I chose to use one primary color for the striping effect, and then I would just pull out a color and go. Black yarn seemed like the best choice because it helped anchor all those crazy colors together, and ultimately made it look really cool when it was finished! If you want to make something bigger or smaller using this pattern, be sure your starting chain is a multiple of 10 (+4). Repeat rows 2 & 3 to desired length. Tada! I mean, how easy is that?! It looks blocky and geometric and cool, but it’s a very simple repeating pattern! I did a total of 102 rows. 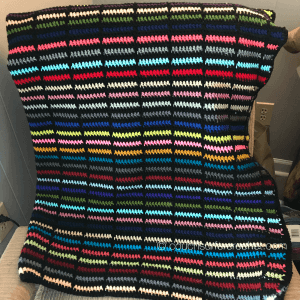 My finished blanket is approx 54″ x 54.” It’s the perfect size to use on the couch. 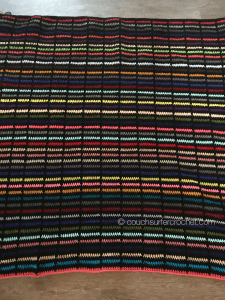 At either end of the blanket you should have a row done in the main color. To create a small border, do an even row of dc down both edges of the blanket and slip stitch to the other corner. This puts one solid black line around the whole edge of the finished piece. I like the simplicity of that edging since the blanket is so colorful. But I bet it would look great with some kind of decorative edging tying in a few of the colors used! Maybe this edge, or this one? If you make something with this pattern, I’d love to see it! 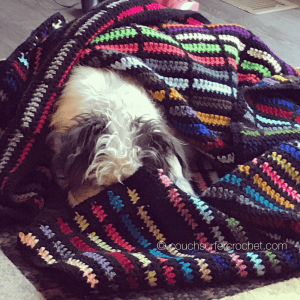 Join me in the Couch Surfer Crocheters group and share there, or find me on Instagram, Twitter, and Pinterest! I was looking for this kind of relaxing project . Merci beaucoup, vraiment très apprécié! 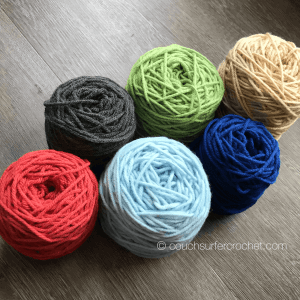 Do you cut the yarn at the end of every row or turn and start new color? Yes, I fasten off and sew in the ends after each round. I like to sew in my ends each time because it saves so much work at the end!